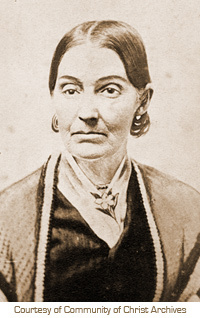 Lately, Emma Smith has become quite the popular figure in Mormon history circles. I’m offering some of my thoughts about Emma, her legacy, and our modern-day treatment of her story. During my time working at the Joseph Smith Historic Site in Nauvoo, Illinois, I’ve seen many people pick up a certain postcard depicting Emma Smith. They gaze at her photograph, the one with the embroidered shawl around her shoulders and her simple gold-plated necklace around her neck, and they say, “She just looks so tired. She had such a hard life, I can’t even imagine.” Her right eye droops and her mouth is turned down. She may look sad to modern eyes. But Emma was in her 60s when that photograph was taken, and besides, people didn’t smile for photos back then. Back then, most women lost half of the children they bore; back then, settlers of all types, of all nationalities, all across the fledgling United States, eked out a living from the rough, stony ground and disease-ridden swamps.